Patient safety during hospitalization is a constant concern, given the possibility of infections, errors, or accidents. But hospitals can also be a hazardous work environment for nursing staff – one of the most perilous, in fact. Bureau of Labor Statistics data show that U.S. hospitals recorded more work-related injuries and illnesses causing employees to miss work days than the construction or manufacturing industries. Injury causes include slips, trips and falls, contact with objects such as needle sticks, and violence, but the majority of nursing injuries are caused by overexertion and bodily reaction from motions like lifting, bending, or reaching related to moving or transferring patients who have limited mobility. The Department of Veterans Affairs (VA) has been at the forefront of an effort to protect nurses and reduce the incidence of those injuries. The Veterans Health Administration (VHA) implemented a Safe Patient Handling program in all VA medical centers a decade ago, and has since seen a dramatic reduction in nurses’ injuries. Caregivers regularly reposition and transfer patients who have limited mobility as an integral part of their care, traditionally using manual techniques that emphasized using proper body mechanics but too often resulted in musculoskeletal injury. The pilots were highly successful, said Earwood, and in 2008, a VHA “Executive Decision Memo” and funding of more than $200 million signaled the national roll-out of the Safe Patient Handling program in 153 VA medical centers. The program to reduce injuries focused on patient-handling because, with approximately 47 percent of injuries resulting from mobilizing patients, it is the most common work-related injury to nursing staff, which includes registered nurses, licensed practical nurses/licensed vocational nurses, and nursing assistants. The program has made a significant difference. “Since the implementation of Safe Patient Handling in the VA, nursing injuries overall have decreased 40 percent, and specific injuries related to patient-handling have been reduced by 50 percent,” Earwood said. Caregivers regularly reposition and transfer patients who have limited mobility as an integral part of their care, traditionally using manual techniques that emphasized using proper body mechanics but too often resulted in musculoskeletal injury. “Nurses mobilize patients; we know that’s risky,” Earwood said. She pointed to research estimating that “in an inpatient setting, nurses will lift, push, pull, tug approximately 1.8 tons in an 8-hour shift if they use manual techniques alone,” adding that most nurses work 12-hour shifts. To reduce the risk of injury, the SPHM program utilizes a wide array of technology to mobilize patients. Overhead full-body lifts using slings mounted on ceiling tracks assist with transferring patients out of bed and into a chair, for example. Earwood said when the program was instituted, the goal was for all facilities to have full-body lifts in at least 75 percent of their direct-care areas within the first years of the program, and that has been successful. In an effort to share best practices with the private sector, a number of facility coordinators participate in a group called Universal Safe Patient Handling and Mobility, “working with private partners and even internationally to share ideas. There are private-sector facilities that have excellent programs; we want to learn from them, and they’re learning from us,” Earwood said. Collaboration also occurs at SPHM national conferences that include the VA and private sector. 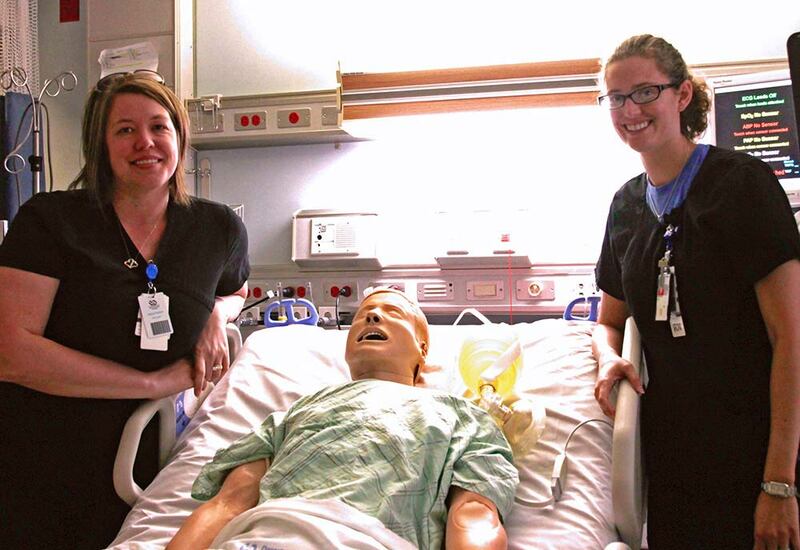 And some facility coordinators are partnering with schools of nursing and the American Association of Colleges of Nursing to assist them in connecting with vendors, for example, in an effort to augment the technology in their simulation labs. Training for SPHM increasingly highlights utilization of simulation technology, according to Earwood. “We have simulation coordinators throughout the VA and it’s definitely becoming more of a focus area for all types of training,” she said, adding that simulating specific scenarios regarding new and emerging patient mobilization challenges was highlighted at a recent VA-hosted SPHM conference. Noting another trend, Earwood said while the overall and patient-handling injury rates for VA nurses continue to decrease, injuries from assault have increased approximately 31 percent over roughly eight years. “Even though the rate of injuries from assault is still lower than the rate of injuries from patient-handling, it is an increase, and we recognize that needs to be an area of focus,” she said. Earwood identified other challenges in their efforts to reduce nurses’ injuries. “Our schools of nursing, even though they have some of the most amazing simulation spaces, are still teaching our students body mechanics as the primary way to prevent injury from moving patients. So, our schools are behind, unfortunately. That’s probably one of biggest challenges we face,” she said. Additionally, she pointed to the need to support facilities’ efforts to replace SPHM technology and equipment as it ages, and to promote design aspects that enhance SPHM components in facility renovation and construction. Earwood emphasized that the VA is committed to providing a safe working environment through access to technology across all settings, through construction and design, and through training. She referred to a 2015 National Public Radio feature highlighting the VA’s SPHM program development as an example of innovation and leadership regarding reduction of nurses’ injuries.